WEBB Banks, the newly created wine and spirits super distributor, is having fantastic success in the region, CEO Andy Consuegra tells TMI. Created from the joining of North Carolina’s Banks Channel and Miami’s WEBB, the merger gave the combined company the scale, the leverage and breadth of portfolio that the partners did not have separately, says Consuegra. “With our new scale and leverage we grew 43% in 2018. And through February we are up 21% versus those great 2018 numbers,” he confirms. The first year was a learning experience, he admits, as two cultures came together and two hurricanes devastated parts of the Caribbean. WEBB Banks is the number one wines and spirits supplier in the Caribbean, but the company has even loftier goals, says Consuegra. WEBB Banks’ strong relationships with its partners in the region is key to its success. Even with its strong relationships, WEBB Banks’ success depends on its brands, says Consuegra. “We have a great balance of wines and spirits. We have hot brands. Tito’s is our number one brand and continues to grow in double digits. Our number two brand is 19 Crimes, which doubled last year. Our number three brand is Beringer, which has come out with Beringer Bros.,” he says. WEBB Banks has had great success with 19 Crimes and its Living Wine Labels, shown here in the Dominican Republic. WEBB Banks has had particular success with the Living Wine Labels from Treasury Wine Estates. Using the augmented reality Living Wines app, consumers hover their mobile device over each bottle to bring a story to life. The augmented reality plays a short video clip that is triggered by the label on the wine bottle. 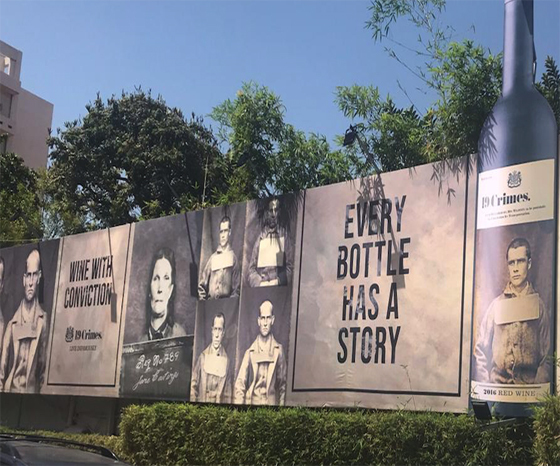 The experiences offered through the platform range from bringing characters from the brand to life on the label, promoting the historical features of some of the world’s oldest wineries, and educating wine lovers through the voice of a winemaker. The latest iteration extends beyond a single animated wine label to two labels that interact with each other. The Living Wine Labels app has been downloaded more than one million times across the world. Originally created for 19 Crimes wines, which is a two million case brand in the U.S., the augmented reality Living Wines Labels app is now available on seven other Treasury wines including emBrazen, Gentleman’s Collection by Lindeman, Beringer Bros., The Walking Dead, Lindeman’s, Matua, and Chateau St Jean. 19 Crimes wines has a great backstory. In 18th-century Britain, criminals guilty of at least one of the 19 crimes, were sentenced to live in Australia, rather than death. With the app, the stories of the Australian convicts on the labels are brought to life. Macallan revamped and renamed some of its core whiskies last year and WEBB Banks is launching its newest offering at the Summit of the Americas. Double Cask is made from American oak and Spanish oak both of which are seasoned with sherry, while Triple Cask is Spanish oak seasoned with sherry, American oak seasoned with sherry, and American oak seasoned with bourbon.